Tour New Zealand on this varied self drive tour, offering a behind-the-scenes peek into movies made in the country. This diverse and rewarding tour includes visits to filming locations for Pete's Dragon and the Lord of the Rings and Hobbit trilogies. Along with an insight into the film world, you will also visit many of New Zealand's iconic destinations and enjoy a range of exciting activities. Explore Middle Earth, walk where Elliot the dragon lived and step into the peaceful world of the Shire. You can expect to spend around NZ$230 in fuel cost on this itinerary based on an intermediate sized car. Collect your rental vehicle for your Fine Tours New Zealand holiday. You can choose from an extensive range of late model cars and 4WD vehicles, from Europcar, Budget or Hertz. Perched on the edge of a large natural harbour, New Zealand's ‘City of Sails’ offers the best of both worlds. Sandy beaches, native bush and lush rainforests give way to a vibrant urban culture, humming with life. Spend time in the Viaduct Harbour - try your hand at sailing an America’s Cup yacht - or take the ferry to nearby Waiheke Island for a gourmet food and wine experience. Walk (if you're that way inclined) to the top of Auckland's highest volcano, Mt Eden, and take in soaring views of the gulf. Pack a picnic lunch and lose yourself in one of the 800 regional national parks on offer or grab a book and relax on a deserted beach. Head up the Sky Tower, standing at just over 300m tall (about 1,000 feet) and have a meal in the 360 degree revolving restaurant. Scale the outermost perimeter of the Harbour Bridge - or test your stomach and bungy off both. To end your day, catch a cab to Ponsonby Road and sample some upmarket culinary delights. A short 25 minute cruise through the Waitemata Harbour and Hauraki Gulf delivers you to Rangitoto Island, the largest and youngest of Auckland's volcanic field. It last erupted around 600 years ago but is considered extinct and safe to explore. During your trip to and from the island you'll enjoy fantastic views of the volcano and the urban backdrop of Auckland. Upon arrival you'll be greeted by your guide and taken to waiting four wheel drive vehicles nearby. Once on board - journey through rugged lava crops and native bush while you learn about the fiery history and geology of the island. You'll then be dropped of at the base of the summit, only a short climb along a wooden boardwalk to the top. After taking in the 360 degree panoramic views, rejoin the tour vehicle for the return trip to the wharf. Times are based on averages for this specific route and allow for stops. Use these times as guidelines and to assist in the planning for your day. Peppered with natural hot springs, boiling mud pools and steaming geysers, Rotorua sits within one of the worlds most active volcanic regions. But geothermal landmarks aside, this city of sulphur has a rich indigenous history. Home to several prominent Maori tribes, a visit to the Mitai Maori Village should be high on your agenda, as should an excursion to the Polynesian Spa for an invigorating soak in its natural mineral hot springs.Live on the edge when you hop aboard a helicopter bound for White Island, New Zealand’s most active volcano. Spike your adrenaline at Agroventures on stomach-dropping attractions such as static skydiving, or a giant swing reaching 130 km per hour. Go up the Gondola for soaring lake views, and ride the luge at night for an extra thrill.Fans of Lord of the Rings and The Hobbit should drive to nearby Matamata and experience the actual movie set ‘Hobbiton’. Make the most of your time in Rotorua with an excursion through the Wai-O-Tapu Thermal Wonderland, one of the area’s most colorful volcanic attractions. Also known as The Redwoods, Whakarewarewa Forest is home to magnificent Californian Coast Redwood trees. With over 5600 hectares of forest, walkers, bikers and horse riders frequent the well maintained trails. Whakarewarewa Forest is also where the 2016 Disney film, Pete’s Dragon was shot. At Rainbow Springs you'll have the chance to see some of New Zealand's native flora and fauna within the majestic forests of Rotorua. Wander the beautiful tree-lined park and take in the flourishing bush, ferns, flowers and plants. Come face to face with, and learn more about, New Zealand’s precious wildlife. See the spring-fed pool with rainbow, brown and tiger trout, then visit the on-site aviaries - home to New Zealand species such kea, kaka, tui, kereru and kiwi. The tuatara, known as New Zealand's living dinosaur can also be seen here.Go behind the scenes with New Zealand's national animal at the purpose built Kiwi Conservation Centre - created solely to try and stop the extinction of this unique species. Here you will gain first hand insight into the conservation efforts being made to increase the numbers of kiwi eggs being hatched and returned to the wild. The drive from Rotorua to Wellington takes you via the township of Taupo home to New Zealand’s largest lake. Following the lakeshore South you’ll pass Turani and then ascend the central plateau onto the high country Rangipo Desert. Skirting the edge of Tongariro National Park, you’ll reach the military town of Waiouru before descending through rich farmland and the rural towns of Taihape And Mangaweka. 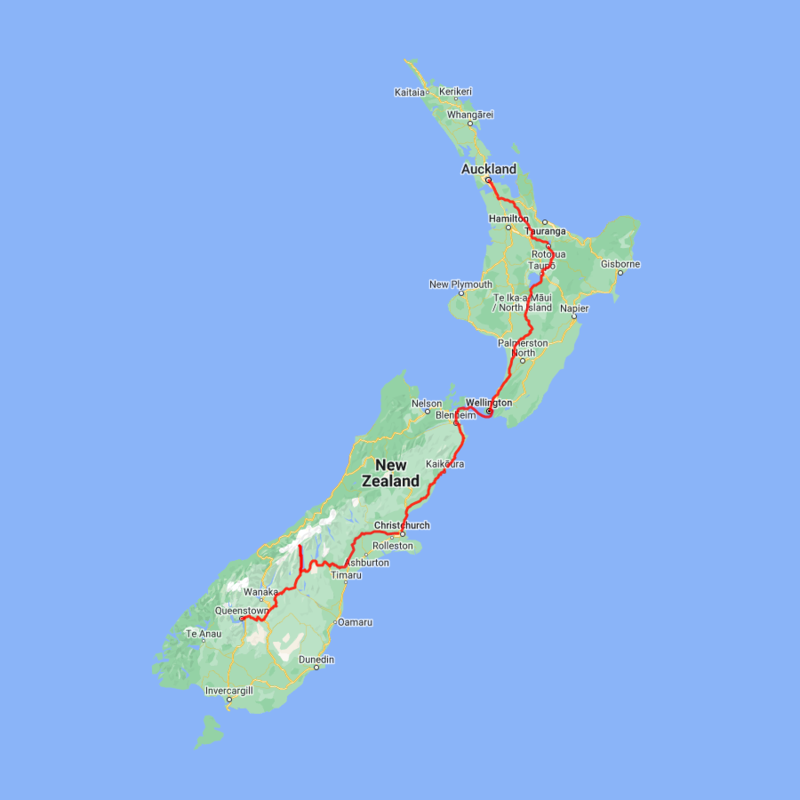 Follow the coast through Paraparaumu, Paekakariki and Plimmerton to arrive at your destination, Wellington. Visit The Weta Cave, a mini-museum filled with props, characters and displays from well known movies including Avatar, The Hobbit and Lord of the Rings. Hear stories of how these figures were brought to life and learn about the artists who created them. Watch behind-the-scenes interviews from Weta co-founders Sir Peter Jackson, Richard Taylor, Tania Rodger and Jamie Selkirk - and gain insight into the creativity and imagination that comes with crafting the art of Weta. You'll also take a guided tour through the inner workings of Weta Workshop and learn about its processes and design elements. Please keep in mind that many of the projects Weta Workshop has been involved in contain graphic scenes and special effects that may not be suitable for everyone. In a small group, you will head out to the Valley to explore the filming locations for Rivendell where Frodo recovered from his knife attack; the River Anduin where the Fellowship voyaged to Amon Hen; the Gardens of Isengard, where Gandalf rode to see Saruman and the site of the orcs felling the trees; see the quarry used for the filming of Helms Deep in Rohan and Minas Tirith in Gondor. Then back to the City to visit the Mount Victoria lookout and Buckland Forest where you can take a "shortcut to mushrooms", "get of the road" and hide where the Hobbits hid from the Black Riders before taking a run to the Buckleberry Ferry and discovering Dunharrow Rohirrim encampment along the way. New Zealand's only marine based whale watching company, Whale Watch Kaikoura offer visitors a once-in-a-lifetime up close encounter with the giant sperm Whale. You are also likely to encounter New Zealand fur seals, dusky dolphins and albatross. Depending on the season you may also see pilot, blue and southern right whales as well as migrating humpbacks. Often orcas can be spotted here and the world's smallest dolphin, the Hectors, is sometimes seen. You'll be taken out in modern catamarans specifically designed for whale watching - featuring large passenger cabins and outside viewing decks. Passenger numbers for each tour are kept below the vessel carrying capacity to ensure your tour experience remains a personal one. Hop aboard the Grand Tour luxury coach for an interactive guided journey around Christchurch. See the best of this port city including beautiful parks, gardens, seaside suburbs and hills. You will learn about its history and future plans for the well under way multi-billion dollar rebuild following the devastating earthquakes of 2010 and 2011. Included in the tour are four of Christchurch's premier attractions - punting on the Avon, the Caterpillar Botanic Gardens tour, the Christchurch Gondola and a hop-on hop-off ticket for the heritage Tram. Today you'll drive through the heart of the South Island, crossing the vast Canterbury plains. Catch your breath in Geraldine before continuing through Fairlie. Ascending Burkes pass you'll come to the picturesque lakeside town of Tekapo. Follow the road and take in the view of Aoraki Mt Cook (New Zealand's tallest mountain) from the shores of Lake Pukaki, known for its glacier fed turquoise blue color. Continue along the lake to your final destination Mt Cook Village. Please note there are no food or shops at Mount Cook you will need to stock up prior to arriving in Mount Cook if you wish to self cater. A rugged back road 4WD adventure accessing awe inspiring views over the Tasman Glacier and its gigantic moraine wall. You will get to stop at several vantage points and have the opportunity to walk up to the top of the Tasman Glacier moraine wall to view some of the most spectacular photographic opportunities within the Aoraki/Mt Cook National Park. Your professional guide has a wealth of knowledge of the Aoraki/Mt Cook area. Learn about the area, its unique geology, local flora and fauna and get an entertaining insight into the rich pioneering history and stories of the past 150 years. Leaving the alpine region of Mount Cook, you'll travel through the lakeside town of Twizel, then a little further to Omarama - the gliding capital of New Zealand. Continue on over the Lindis Pass, one of New Zealand’s highest roads with a summit of 971 meters. Arrive in the quaint village of Tarras, then continue on a short way to the historic Bendigo Reserve, one of Otago’s original gold mining settlements. Follow the road to Cromwell, and keep going through the sheer cliffs of the Kawarau Gorge towards the Gibbston Valley, one of New Zealand's premier wine growing regions. See the historic Kawarau Bridge where you can bungy jump or relax and watch others take the plunge. Approaching Queenstown, the Remarkables mountain range comes into view as you arrive into the adventure capital of New Zealand. Go back in time on this return trip to Walter Peak High Country Farm aboard the historic TSS Earnslaw steamship. You'll be greeted off the boat and guided through beautiful lakeside gardens to the charming homestead. Here you'll enjoy a Gourmet BBQ dinner which your chef will prepare in front of you. The seasonal menu includes an expansive array of local produce, including succulent meats cooked on the outdoor rotisserie and a selection of delicious vegetables and salads. Finish your meal with an irresistible dessert, New Zealand cheeses and freshly brewed tea and coffee. After dinner, an entertaining and informative demonstration gives you a glimpse of life in the high country. On your cruise home, enjoy the camaraderie of a singalong with the ship's pianist or breathe in the fresh night air as you watch the lights of Queenstown draw nearer. Although celebrated as New Zealand's ‘adventure capital’ Queenstown offers far more than a fast paced action-packed holiday. Settled on the shores of Lake Wakatipu beneath a soaring panorama of the Remarkables Mountain Range, this alpine town is surrounded by a plethora of historic, gastronomic and scenic wonders. Head down the Gibbston valley wine trail to sample some of the region’s best Pinot or catch a ride on the 100 year old Steamship - the TSS Earnslaw - to Walter Peak Station for dinner and a farm tour. Browse the waterfront cafes and have lunch at Michelin star chef Josh Emett's ‘Rata.’ Check out nearby historic Arrowtown and enhance your experience with a four wheel drive trip to Macetown. Take a leisurely lakeside stroll or ride the gondola for breathtaking views. Venture further afield into the Fiordland National Park or head over the Crown Range to Wanaka. Drive through Lord Of The Rings country - or for the really fanatic, jump aboard one of many dedicated LOTR tours. And after all of that - if you do really want the adrenaline rush Queenstown is known for, take your pick from the Shotover Jet, Nevis Bungy, Canyon Swing, Zipline, Luge or Heli-ski. An hour and a half of thrilling high-speed wilderness jet boating skimming across the clear waters of the Dart River into the Te Waipounamu World Heritage Area. Hear about flora, fauna and history on a 30-minute rolling forest walk with your friendly guide. On a backroad tour of Paradise immerse yourself in scenes and backdrops from The Lord of the Rings and The Hobbit movies. Learn about the Pounamu (Greenstone) that made the Dart River a key trading route for early Māori. Tales of early settlers who carved rich farms from the rugged landscape. Take in the sights of Queenstown one more time before returning your car to the airport and catching your onward flight.